Anxiety and depression are pathologies that affect individuals in many aspects of life, including productivity, health, and social life. Anxiety is the state of feeling nervous or unease about something or situation with an unclear outcome. Anxiety is a normal and healthy emotion. However, when an individual habitually feels disparate levels of anxiety, it might progress to become a medical disorder. Depression, on the other hand, is the feeling of severe hopelessness and misery. It is a mood disorder that causes an obstinate feeling of sadness and lack of interest. It has an impact on how you feel, think and behave and can lead to a range of psychological and physical problems. Cannabidiol (CBD) is a natural compound (cannabinoid) which is present in cannabis plants. It is non-psychoactive unlike other cannabinoids found in the cannabis plant, such as tetrahydrocannabinol (THC). Cannabidiol has significant antioxidant properties that are beneficial in the treatment and management of neurological conditions. One of the most popular uses for Cannabidiol (CBD) is for assisting individuals to manage anxiety. CBD assist in managing anxiety by relaxing both the body and the brain while striking the balance in the endocannabinoid system. CBD is useful in managing various types of anxiety, ranging from panic attacks to normal anxiety. Many people have successfully used a vape pen to manage acute panic attacks and anxiety. CBD has also been used in managing anxiety related to serious conditions such as post-traumatic stress disorder. Studies show that CBD could reduce symptoms of social anxiety in people suffering from social anxiety disorder. CBD is an exciting alternative for managing depression. Traditional antidepressants, more often have many adverse effects. The drugs often have to be taken for a long period before the effects start to show. They also have radical effects on a person’s mental and physical well-being. CBD may not be as strong as these traditional antidepressants and targets depression in a holistic manner. According to research published in 2014, CBD oil had anti-anxiety and antidepressant effects. In this study, various experiments on disorders, such as the forced swimming test (FST), Vogel conflict test (VCT) and elevated plus maze (EPM) was performed on animals, and these studies proposed that CBD exhibited an antidepressant and anti-anxiety impact on animals. Full spectrum CBD improves the sleeping patterns of its consumers. At the same time, the quality of sleep is also improved and consumers suffering from sleep deprivation report waking up feeling well rested after they started vaping. 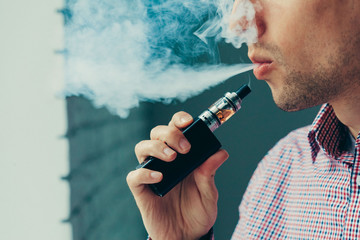 One advantage of vaping CBD is the reduction of smoke inhaled into the lungs. Vaporization, compared to conventional smoking, is much safer. While conventional smoking of cannabis is illegal in almost all states, vaping is generally accepted. Therefore, vaping CBD also ensures patients to get their medication while avoiding the legal consequences. Since most CBD vape pens are compact for example the mighty vaporizer, one can vape anywhere and anytime, discreetly. There is also significantly reduced odor in vaping as compared to smoking hence can be used in public areas. While traditional antidepressants take several days or even weeks before taking effect, the result is instant with vaping. CBD vaping is beneficial for individuals who have severe symptoms and need immediate treatment. You can find the most popular vaporizers and their reviews at Herbonaut. CBD is a non-psychoactive form of cannabinoid which does not interfere with the cognitive functions of the brain. This means that CBD does not get you “high,” unlike THC, which interferes with the cognitive functions of the brain. CBD is not addictive and thus has no potential for abuse or dependence. This is due to the fact that CBD does not have any addictive substances, unlike cannabis which contain THC which can be addictive. It’s also important to note that when you stop using CBD, there are no withdrawal symptoms. CBD is one of the naturally occurring chemical substances found in cannabis sativa and has been shown to have immense health benefits in treating conditions such as anxiety, depression, mood swings, and inflammatory diseases. CBD vaping helps to manage depressive symptoms and the individual’s quality of life. However, individuals should consult a physician before starting the use of CBD either for anxiety or depression.